The shelter “Koshkin Dom” was founded in October 2016 in the city of Karaganda. The shelter was founded with the help of volunteers. It functions thanks to the donations of the caring inhabitants of the city. Currently, the shelter hosts 40 cats and kittens, as well as about 30 dogs and puppies. There are three active volunteers and a caretaker to take care of the pets. All the residents of the shelter receive the necessary primary health care – they are all sterilized and castrated. The animals are placed in the shelter according to a guardianship agreement. The mandatory conditions of the agreement are the volunteers’ control of the selected animals, castration and sterilization of each animal upon reaching a certain age. The shelter was founded to give a temporary or permanent home to injured and crippled cats. However, some time later, despite the difficulties of providing the necessary living conditions for the pets, the shelter started to provide assistance to crippled dogs and abandoned puppies. “Koshkin Dom” is located in a villa village. The shelter is a residential house with a total area of 45 m2. The house is adjacent to a territory of about 10 hectares. It is planned to use this territory for the construction of cages for keeping dogs. “Koshkin Dom” is a very young organization. It is constantly in need of help and financial support to create more favorable living conditions for the pets it hosts. 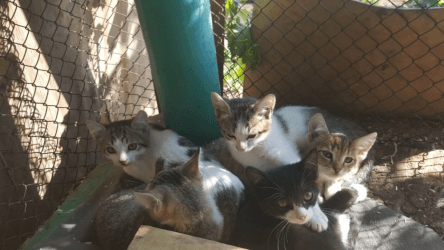 At the moment, the organization is facing the urgent problem of fencing the shelter as dacha season is ahead and the residents of this villa village might not like living in the neighborhood of the shelter’s pets. It is also necessary to build cages for dogs, a summer cage for walking the cats and a new extension to the house for expanding the living territory for kittens and puppies.